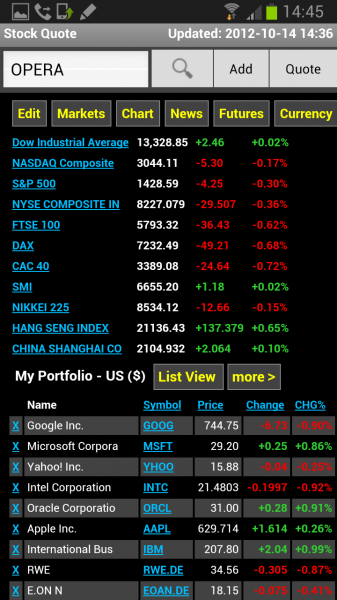 An Android app like Stock Quote may be useful to you if you have invested money in the stock market, are thinking about it, or are just interested in finance in general. The free app ships with a lot of functionality. It supports major stock markets like the Dow Industrial Average, the S&P 500, the German DAX, the Japanese NIKKEI 225 or the Hang Seng Index, and all the stocks listed in those indexes. It on top of that offers information about currencies, funds, commodities, ETF and a set of tools that may assist you in your financial activities. When you first start the program you see a list of markets and stocks that have been added to the program by default. To edit the markets, simply click on the Edit button at the top of the app to do so. Here you can select and remove markets so that only those that you are interested in are displayed with their value and change. Below that is your portfolio listing that you can use to monitor specific stocks that you are interested in. To add a stock to the list, enter a company name or stock symbol in the search form at the top and click on the search button. If you know the symbol, you can instead hit the add button directly to add it to your portfolio. You can click on any symbol here to display real-time stock information including the stock's chart. Here you can also open news, a larger chart, historical prices, or the Google Finance or Yahoo Finance websites that host additional information about the selected stock. There is a slider at the top that you can use to quickly flip through your portfolio. The Stock Quote app has a few other aces up its sleeve that you may find useful. From adding shares that you have bought over a currency converter to options to receive alerts when a stock crosses a limit that you set in the app. 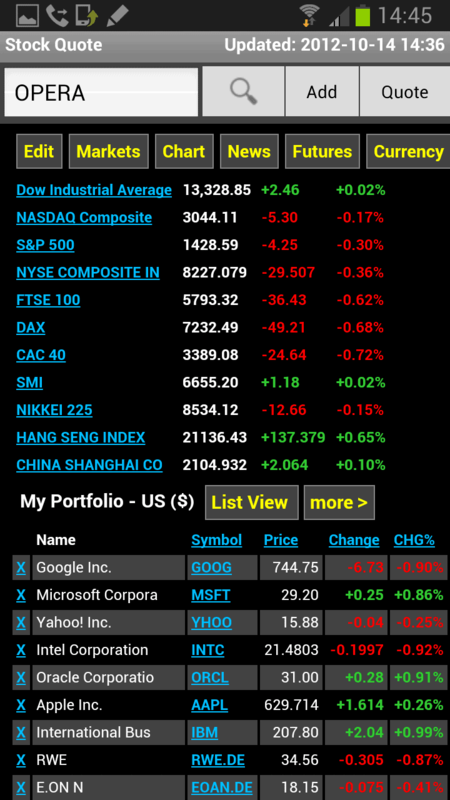 The best feature from my perspective is the market and stock listing on the main page. It provides you with a one-click overview of all the markets and stocks you are interested in. 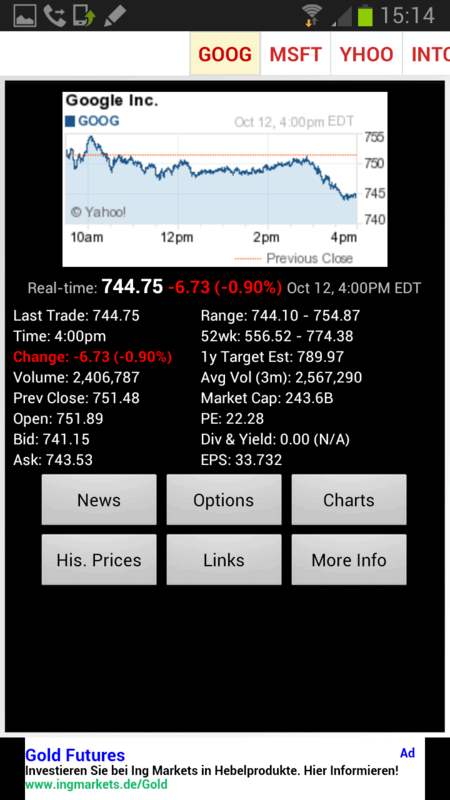 You find more information about the Stock Quote app on Google Play. Cool. This app has no stupid permissions like reading your contacts or making phone calls. Yeah, that is one of the things that I’m checking before installing apps or considering them for review. This may mean that I can’t review some apps that are pretty good, but I prefer to be safe than sorry.